Ribbons of yellow light cut through the trees. The soft green moss underfoot is fragrant with musk. Encroaching mist turns the horizon to haze. In the distance, the languorous crawl of a stream can be heard. 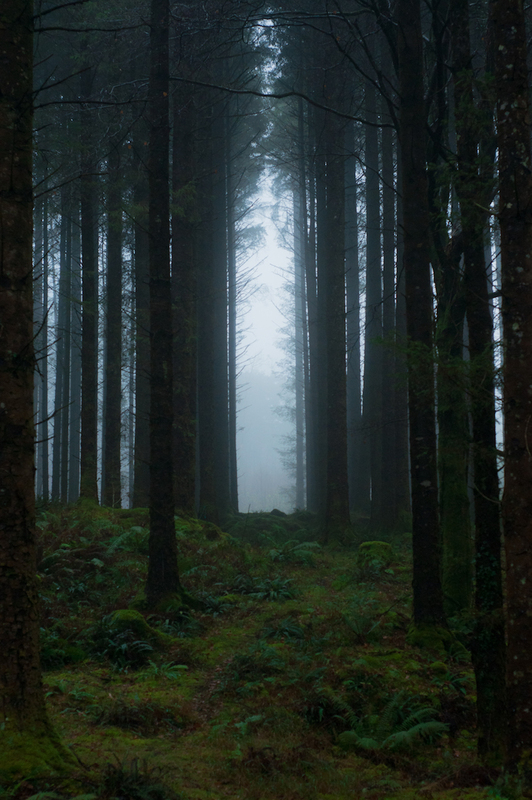 Take a walk through any Irish woodland and it is easy to see why the landscape is steeped in mythical lore and legend. Home to a wealth of flora and fauna, the forests of Ireland are a rich source of inspiration to gardeners and growers alike. And for centuries, folklore and fable have told tales of more enchanting scenes between the tall trees and ferns. In our native woodlands, wildflowers seize the narrow shafts of stark spring light permitted through the trees, to grow before late summer arrives. By then, leaves on high branches are in full flourish and swallow up the light from above. This is also why most wild flora can be found in and near the edges of woodland, where nourishment from light is more readily available. The lemon yellow slips of the primrose are one such wildflower ubiquitous to the Irish woodland. However, like many flowers in the surrounds, its delicate petals carry the weight of superstition. In ancient Ireland it was believed that if you consumed the bloom of a primrose, a faerie would appear before your eyes, and it is still used as an edible flower today, with a flavour akin to the mildness of a lettuce leaf. The ornamental foxglove bears equal symbolism. Found along the fringes of the woodland, the vibrant plant has a name derived from the phrase “folk’s glove”, meaning “belonging to the faerie folk”. As lore would have it, unruly faeries gave the bell-shaped flowers to the foxes to wear on their feet, so to soften their steps whilst hunting. Echoing the foxglove in silhouette, the bluebell is an ethereal fixture of the Irish forest. In summer bloom, the short-lived perennials can be found growing in the same sun-dappled locale year after year. A gathering of bluebells may be encountered in a clearing, appearing as a perfumed purple-blue veil stretched out over the woodland floor. Seemingly innocuous, the wildflower is made up of a cluster of bright goblets upended from their stem, their lips sweetly scalloped. However, if one were to wade through an assembly of bluebells, it was rumoured that they would soon fall under enchantment, and meet a sombre fate. The bluebell bulbs are extremely toxic, which may be the origin of the portentous associations with the flower. Though wildflowers are a striking feature of a traditional Irish woodland, the imposing sweeps of trees are the natural commanding force. The sessile oak is the most dominant species, towering over the alder, hazel and Scots pine in both altitude and abundance. Further old wives’ tales apply to trees as they do flowers, such as the black-budded ash tree. It was believed that if you were to place ash berries in a cradle, the infant would be protected from the faeries. While in an amass of greens and browns, the rowan tree adds scarlet punctuations to the earth-toned woodland. Growing especially well on higher ground, the shade of red was supposed to act as protection from spells and enchantment. Accordingly, rowan branches would be draped indoors to protect a home from fire. While these plants have varying significance in folklore, one particular native tree is cloaked in superstition. The hawthorn is ragged and wild, its branches knotted across one another. Producing crisp white flowers each spring, woodland hawthorn blossom grows on the periphery of forest borders, in sunlit spots between larger trees. It is said to guard the entrance to the faerie realm, and it is still believed that by harming one, misfortune will find you. 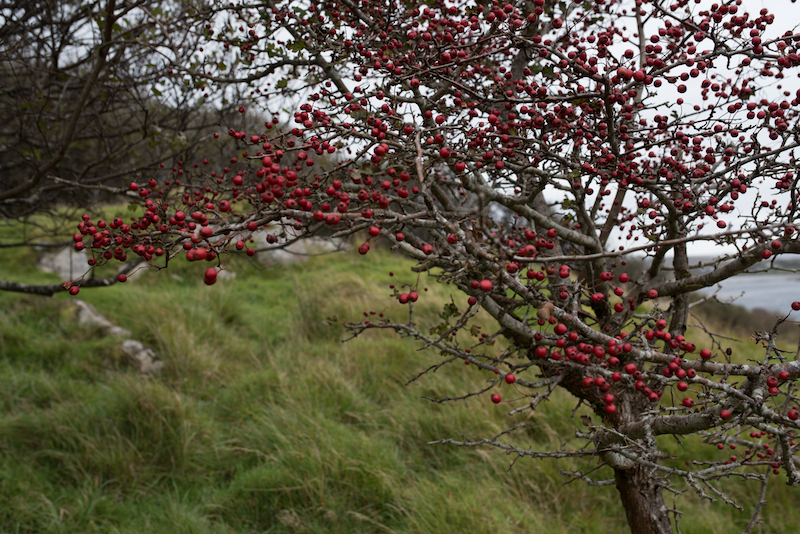 My grandfather told story of a road built through Clare that encountered a hawthorn tree along its path of construction. A local folklorist raised an objection, explaining that the tree was the meeting point for feuds between faerie clans, and to mar it would be a bad omen. To this day there is a kink in the road, weaving around the foreboding aura of the hawthorn tree. In the shaded woodland, hawthorn has also long been linked with fertility. During the convivial celebrations of the Bealtaine festival, eligible women would hold a lacy sprig of the flower close, in the hopes of falling in love. It is essential that these stories and superstitions continue to be recited across generations, bound to the blossom and branch of our forests. William Butler Yeats found a charming way to immortalise these tales, by translating the twist and turn of faerie folklore into poetry. In his 1886 poem The Stolen Child, Yeats illustrates the paradisiacal phenomenon of the Irish woodland, as the subject travels “to the waters and the wild, with a faery, hand in hand”. The lesson to be learnt? Be careful where you tread.